GDDR5X Memory Model provides an smart way to verify the GDDR5X component of a SOC or a ASIC. The SmartDV's GDDR5X memory model is fully compliant with standard GDDR5X Specification and provides the following features. Better than Denali Memory Models. Supports GDDR5X memory devices from all leading vendors. Supports 100% of GDDR5X protocol standard JESD232 and JESD232A. Supports all the GDDR5X commands as per the specs. Quickly validates the implementation of the GDDR5X standard JESD232 and JESD232A. Supports up to 16GB device density. Supports the following device modes. Supports for Single ended interface for command, address and data. Supports for QDR and DDR operating mode. Supports for Programmable read latency and write latency. Supports for Write data mask function via address bus. Supports for Data bus inversion (DBI) & address bus inversion (ABI). Supports for Bank group features. Supports for cyclic redundancy check (CRC-8). Supports for Programmable CRC read latency and write latency. Supports for Low Power modes. Supports for On-die termination (ODT) for all high-speed inputs. Supports Mirror function with MF pin. Supports IEEE 1149.1 compliant boundary scan. 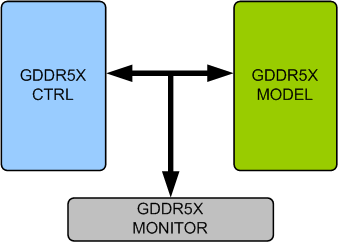 Constantly monitors GDDR5X behavior during simulation. Protocol checker fully compliant with GDDR5X Specification JESD232 and JESD232A. Faster testbench development and more complete verification of GDDR5X designs. SmartDV's GDDR5X Verification env contains following. Complete regression suite containing all the GDDR5X testcases.